It has been said that Anabaptism was born in the city, matured into a Mennonite peoplehood in the countryside and was rejuvenated as a dynamic cultural force in the city. It has also been said that Anabaptism was born amongst villagers, people of the crafts and the farm, and as such has always been in danger of losing its distinctiveness of peace, simplicity and community in the modern city. This conference will seek to focus a debate on this and related issues by examining the history and social basis of the Mennonite life in the city. The conference will highlight the Canadian experience, but papers will also reflect aspects of this phenomenon in Russia, the United States and Germany. 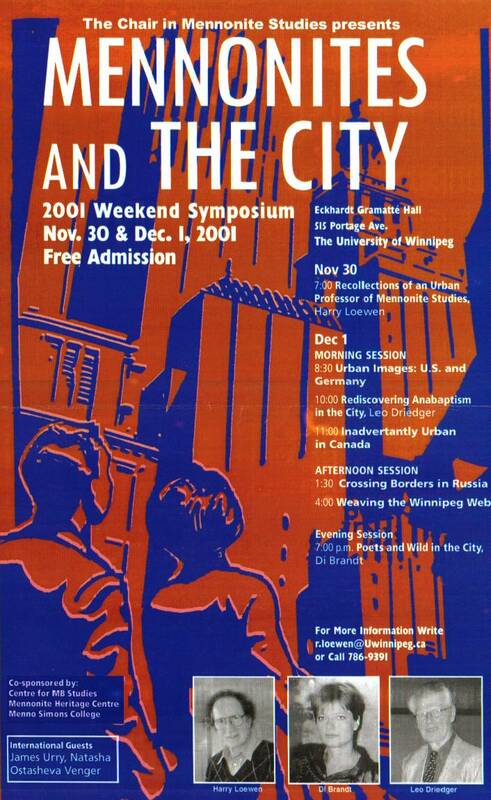 Keynote Address: Harry Loewen, Kelowna, BC, "Reflections of an Urban University Mennonite Studies Professor"
Hans Werner, University of Manitoba, "'Feeling at Home': Soviet Mennonites in Bielefeld, Germany, 1950*1990." Dora Dueck, University of Manitoba, "Images of the City in the Mennonite Brethren Zionsbote, 1890*1940"
Keynote Address: Leo Driedger, University of Manitoba, "Call of the City: Rediscovering Anabaptism." Chair: David Giesbrecht, Mennonite Historical Society of B.C. Sam Steiner, Conrad Grebel College, "The City and the Formation of the Mennonite Conference of Eastern Canada." Johann Funk, Okanagan University College, "Urbanites by Default: Mennonites of the Fraser Valley." Natasha Ostasheva Venger, University of Dniepropetrovsk, "Mennonite Industrial Dynasties in Alexandrovsk." James Urry, Victoria University of Wellington, "Growing up with Cities: The Mennonite Experience in Russia and the Early Soviet Union." Bruno Dyck, University of Manitoba, "Exploring Congregational Clans: Playing the 'Mennonite Game' in Winnipeg." Paul Harms, University of Alberta, "Social Experience and Ethnic Icons in the Enactment of Mennonite Identity in Winnipeg"
Karen Dyck, University of Winnipeg, "Invisible Labour of Survival: The Contribution of Mennonite Women to their Family Businesses in North Kildonan, 1930*1960." Keynote Address: Di Brandt, University of Windsor, "The Poet and the Wild City"
Registration: There is no conference registration and admission is free. Lodging: Participants may stay at the newly refurbished Holiday Inn, 360 Colony Street, half a block east of the University of Winnipeg. A special 'university' rate of $79.00 plus tax is offered to participants who let the hotel know that they are attending the Mennonite Studies conference at the university on November 30 and December 1. Meals: may be purchased on campus or at any of the dozen restaurants within a block or two of the university. Free Parking: is available a block west of the university in Lot E on Young Street, just south of Homer's Restaurant. Plenty of other parking spaces are also available for reasonable rates in the following spots: the Mall Parkade (above the bus depot) with entrance off of Colony Street, one block east of the university; at the Bay parkade two blocks southeast of the university; in several Imperial Parking lots on the east and west sides of the university. Event Poster Please click the poster to view a full-sized image.